The first recorded words of Samson are, “I saw one of the daughters of the Philistines at Timnah. Now go get her for me as my wife.” I don’t know old he was when he made this demand of his parents but in this day and age if my son, who is zoning in on 16, came up to my wife and I and made that demand…I would have to pick him up off the floor after his mother let him have it. You see my wife, Kathy, and I made a promise to God that we would break the chains that held us so that our children would come to know Christ. Now we may not have had the visit by an Angel of the Lord, like Manoah and his wife did, but we both were done with Gaza/Egypt. Samson makes this journey to see this Philistine beauty that is “right in his eyes” and kills a lion. After a few days Samson and his parents make a return trip to visit this beauty when Samson catches a glimpse of the carcass of the lion he killed. He sees honeycombs and then scraps out the honey from the dead lion. 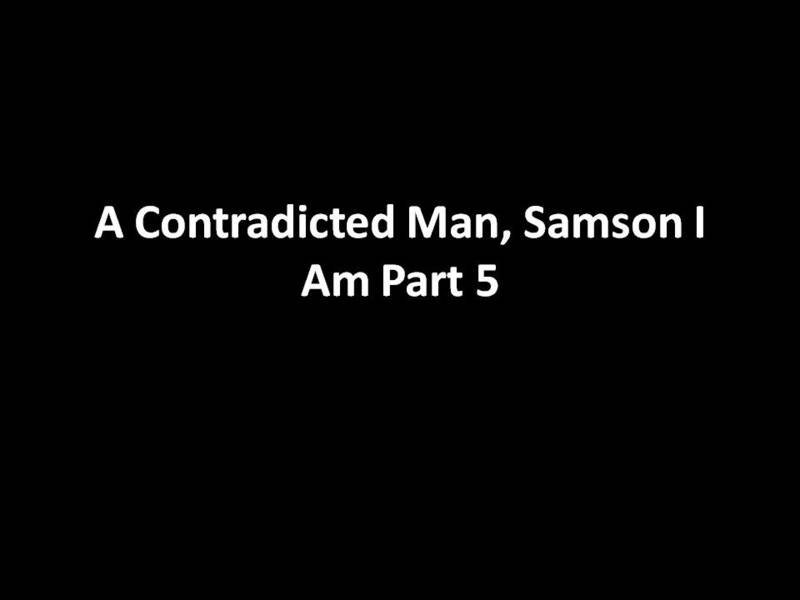 So far up to this point, Samson has skimmed violating the Nazirite Vow that he had bestowed upon him from conception. He touches the dead and is not keeping himself separated, but the funny thing here is that God allows these things to occur so that He could seek an opportunity against the Philistines and their fish god, Dagon. Interesting!! I wonder if Samson understood his purpose. Things kinda settle down after Samson sees a jawbone, kills a whole bunch of Philistines and realizes that his thirst can only be quenched by God who, by the way, opens up a hollow place for him to drink the water that renews his spirit. But then we turn the page to read, “Samson went to Gaza, and there saw a prostitute, and he went in to her.” And now an ambush is in place to capture him because it has been decided by the Philistines that Samson needs to be killed. But it doesn’t happen that way does it? Instead Samson lies in wait, pulls the city gates and their posts from the ground, drags them up a hill in front of Hebron…and then comes Delilah. I believe that the Delilah we face in our lives can be renamed SIN. It looks like a lot of fun until it takes us farther than we want to go, keeps us longer than we want to stay and ultimately costs more than we can afford to pay. In Samson’s case it cost him his eyesight. In the light he saw things as a Nazirite but in the dark he saw things as Samson. I suspect that at the end of Samson’s life the grapes of the field clouded his thinking and that allowed his spiritual enemies to seize the moment. But to the credit of his story, God intervenes and Samson’s hair grows back and that God uses him one last time against the Philistines. I Am Alive, Now What?